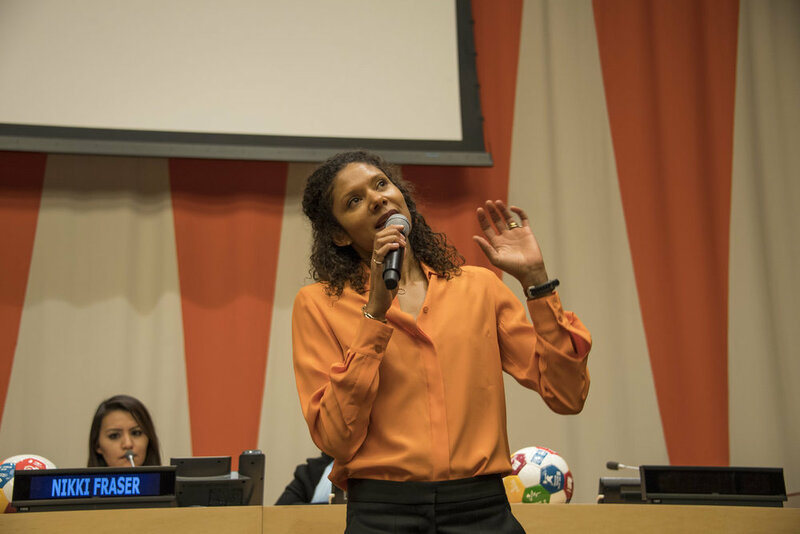 We asked strong advocates and role models of gender equality to nominate a woman who inspired them with her commitment to gender equality— and the Global Goals World Cup Dream Team was born. Fatuma & Emma, New York, April 14, 2017. In the world of sport, heroes are celebrated, elevated to stardom and to serve as the role models of their generation. When it comes to gender equality activists, this is not the case. They fight their fight behind the lines, unnamed, unseen, often at great personal risk and cost. We set out to change that. 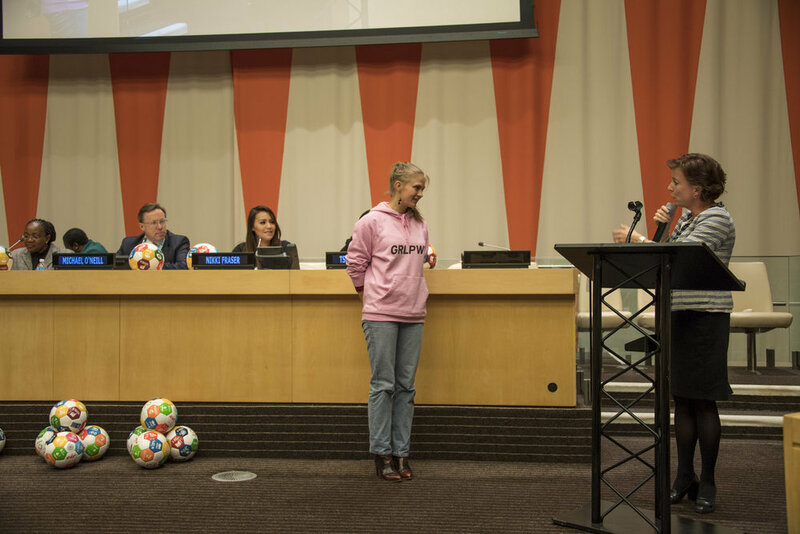 The Dream Team is an initiative by Global Goals World Cup, the Danish Permanent Mission to the UN, UNDP, Save the Children, UN Women, Women Deliver and the City of New York. 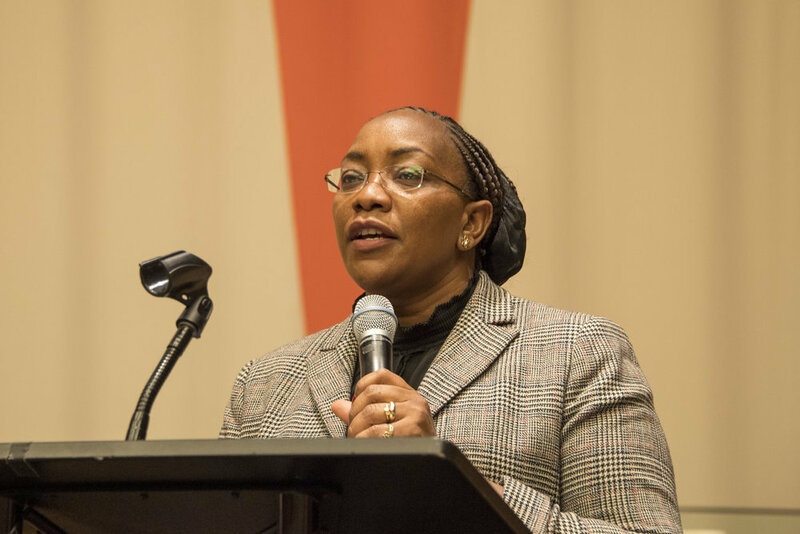 Our first nominators were her excellency Cabinet Secretary of the Ministry of Public Service, Youth and Gender from Kenya Mrs Sicily Kariuki. And her excellency Minister for Equal Opportunity and Nordic Cooperation Ms Karen Ellemann. 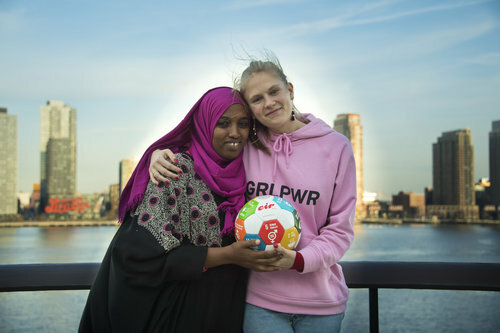 They nominated Fatuma Abdulkadir Adan (Kenya) and Emma Holten (Denmark). 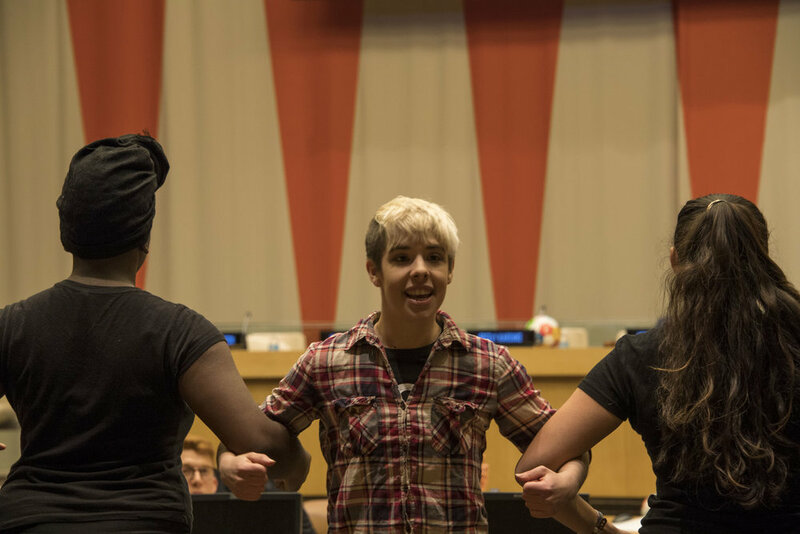 The players were nominated during the Commission on the Status of Women conference at the UNHQ in New York at an event at the ECOSOC chamber in partnership with the Danish and Kenyan Missions and partners. More photos from the event here. The next player was Khalida Popal. A true example of the global and universal nature of sport. She is an Afghan women, with asylum in Denmark, nominated by an Australian football legend. Read more and see the nomination here. After her came Dina Smailova from Kasakhstan. A brave woman who overcame the shame of being raped and shunned by her family, to become the leader of a movement for women who finally break their silence. Read about her here. 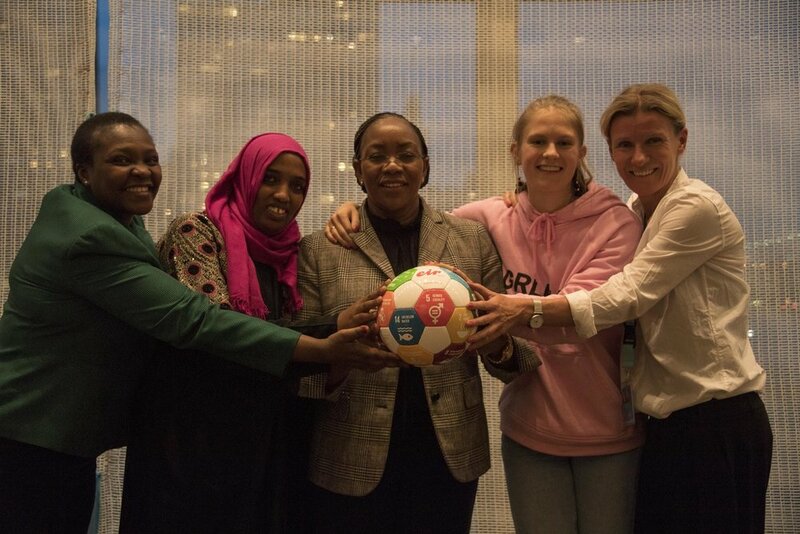 Tshidi Likate of South Africa was our 5th player Dream Team player: A young, yet powerfull and outspoken defender of Girl's rights, nominated by the former first female Prime Minister of Denmark and current CEO of Save The Children International Ms Helle Thorning-Schmidt. Read about Tshidi here. Legendary artist and activist Annie Lennox nominated UNICEF Goodwill Ambassador and Syrian refugee Muzoon Al-Mellehan as the second to last Dream Team player. Read her motivation here. HRH Crown Princess Mary of Denmark announced the final player in 2017 in New York: Assmaah Helal from Australia. 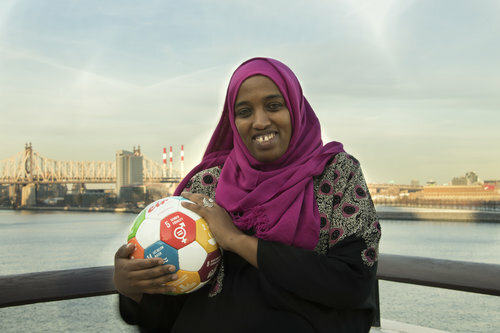 Former Chair of the Commonwealth Youth SDP Working Group and Muslim Sportsperson of the Year in Australia, Assmaah is recognized for her work to increase participation in football for girls from migrant communities.